Sugihara Sensei has an excellent background in weaponry such as the kama, sai, nunchaku, bo, tonfa and katana (samurai sword). 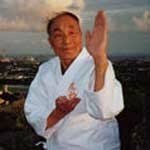 Sugihara Sensei comes across as a quiet, unassuming person, but when you see his technique one is amazed at the power that this Karate Master can manifest in a single move. One can easily see that Sugihara Sensei has trained for over 65 years in the Martial Arts. An excellent administrator, he has organized many large tournaments as well as heading an All Japan Youth Karatedo Association. At 86 years of age Sugihara Sensei was still teaching 2 classes a day, 3 days a week as well as his own daily practice of the Pinan and Naihanchi Kata showing a true passion for karate and living his adage that Karate is for life. This December 2014 Sensei will be 93 and is still active especially at grading time giving demonstrations. Fushin Ryu will live on in Japan through Sensei's grandson Kenji. 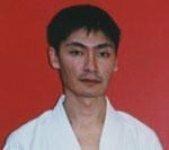 At present a Godan (5th dan) who started training under Sugihara Sensei as soon as he could walk, Kenji Sensei is an innovative karateka who is always striving for perfection in his technique. Kenji Sensei recently came to New Zealand to get married and in the process was responsible for bringing his grandfather Sugihara Sensei (on his first ever plane flight) to New Zealand to visit his Fushin Ryu dojos and to give a seminar. Shihan Kenji currently teaches at several clubs in Japan. Sensei is currently chairman of the New Zealand National Dan Grading Council and is a member of the World Karate Federation Technical Council (the first New Zealander to achieve this position). He teaches classes at his main Dojo in Pt Chevalier, Glenfield and Honbu Dojo. At 8th dan, Sensei Monk is the highest graded non-Japanese Fushin Ryu member. Monk Sensei has been to Japan well over 25 times since 1983 training under Hanshi Sugihara Kenpu including an eight-month training stint in 1999-2000; also attending Karate Masters Seminars in Shiga, Fukuoka and Tokyo as well as World Karate Federation (WKF) Refereeing and Technical Seminars. After 2 years as Karate New Zealand 1st Vice President, Sensei became National President and held the position for 10 straight years. During this time Sensei served on the National Coaching Council and also as a National Kumite Referee and Nataional Kata judge and Oceania Kumite Referee and Oceania Kata judge. Monk Sensei was the second Oceania President and also a member of the World Karate Federation Directing Committee. Previously the Chairman for Karate Auckland (2008-2015) , Chairman of the Karate New Zealand coaching Council (2007-2017) and currently a National Kata and Kumite coach. First NZ coach to have both the WKF Kata and Kumite qualifications and in November 2016 became the first NZ Coach to receive the WKF Certified Kata and Kumite coach licence (1 of only 4 awarded in 2016). World wide a qualification held by an estimated group of under 20 people. Sensei Duane returned to NZ in November 1997 as a 4th Dan where he started teaching at the Browns Bay Dojo. He opened the Albany Fitness Centre and Karate Dojo in Albany, teaching there for nearly 5 years. Sensei Duane received his Godan in December 2002 and in April 2003 opened a new full time dojo on East Coast Rd in Browns Bay. After a long absence from competition Sensei Duane competed in the 2004 NZ Open winning both the Kata and Kumite in the veterans division. Sensei Duane traveled to Yokohama, Japan in 1986 to train in the Fushin Ryu style under Hanshi Sugihara Kenpu. He returned to Japan for six months training in 1987 receiving his Japanese Shodan. Again returning to Japan for a year's training in 1989, Sensei Duane received his Nidan. 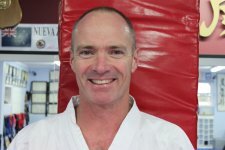 When he returned to New Zealand in 1990, he competed in the Auckland regional tournament (1st place kumite) and national (3rd place kumite, 1st place team) championships, and again in 1991 (3rd place nationals), then represented New Zealand at the Oceania championships (3rd place -65kg kumite and teams) and again at the Asia/Pacific Karate Championships held in Auckland, 1991. He returned to Japan in December 1991 for a further six years training, taking part in many tournaments, coaching the NZ Senior Women's Team at the Tokyo Ladies Cup. He gained some experience in grappling and throwing techniques while in Japan. He started a Karate club on the American Naval Base in Yokosuka. 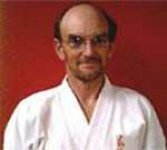 Sensei Braedyn started karate at the Birkenhead Dojo under Kyoshi Len Monk on the 5th July 1982, gaining his Shodan (1st degree black belt) in December 1986. Currently he is a Sandan. He was a member of the first Fushin Ryu Karate NZ team to train and compete in Japan in 1986. Sensei Braedyn quickly established himself on the tournament scene in both kata and kumite winning many dojo, regional and national championships. His hard earned bronze medal in the 1991 Asian/Pacific Union of Karatedo Championships in Auckland started a career in kumite spanning over a decade and has included a 5th position in the 1998 World Championships in Rio de Janiero, Brazil. Braedyn has won a record 13 national Kumite titles including the 2001 Karate NZ Nationals in both his weight category and the open weight division, as well as the NSW Open Championships in 2000. He has also won 2 gold, 3 silver and 1 bronze medals in the Oceania Championships. He has been Auckland Senior Coach from 1997. He currently teaches Kumite classes at Glenfield Dojo. 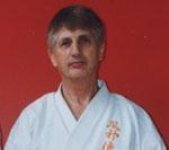 Currently Sensei Braedyn was the Chairman of the Coaching Council for Karate Auckland (until disbanded in 2016), and was a member of the Karate New Zealand coaching Council until 2017. He is currently National Kumite coach and is one of only 4 New Zealanders (as of 2018) to have the WKF coaches qualification in both Kata and Kumite. Senpai Mark Starting training in Shotokan in Feilding under Sensei Rex Painter in the mid 1980's in which he graded to shodan. Theclub affiliated with Sensei Len Monk and changed to Seishin Ryu. He graded to Shodan in 1989 under Sensei Monk and graded to Nidan in 1995. Senpai Mark competed in many tournaments winning bronze in team kumite in the 1991 Nationals, bronze in kata at the 1994 Nationals as well as a bronze in team kata and gold in team kumite at the 1995 Nationals. He also represented New Zealand at 2 Oceania Competitions winning bronze in kumite at the 1994 Championships in Tahiti and in New caledonia in 1995 he won bronze in both individual kata and team kumite. Moving overseas in 1999, he trained at Sensei Tikki Donavan's dojo in London, and with French kata champion Christophe Riccio when he moved to France. He attended many seminars taken by Sensei Ian Cole, Sensei Wayne Otto, Sensei Molly Samuels, Tomiyama Sensei and Sakumoto Sensei. On his return to NZ he trained at several clubs around the country. Training at a Shotokan dojo in Whakatane he passed his Sandan grading under Asai Sensei when he visited NZ in 2005. Since 2008 he has been back training full time with Fushin Ryu and running the dojo at Ohope Beach in the Bay Of Plenty. Still entering tournaments he has found success in the veteran divisions winning gold at national level (veterans kata) 2009, and gold at the 2009 Sugihara Cup in veteran's kata. Senpai Mark visits Auckland regularly training with sensei Duane at the Brownsbay dojo he has also competed in boxing charity events and has coached his new students to competition success in the Auckland Kyu grade championships. 2011 was another successful year for Senpai Mark winning Gold in Kata at the 4th Sugihara Cup as well as Gold in kata at the NZ open in Christchurch and the Auckland Open. Senpai Martin first karate training was at the Chidokan Dojo while in his 20's. He studied Tai-Chi and Bagwa for 6yrs with a special interest in the Dim Mak aspect of the Chinese martial arts. Senpai Martin restarted his Karate career in 1995 at the Birkenhead Honbu Dojo under the tutelage of Kyoshi Len Monk. Traveling to Japan in 1997 with a Fushin Ryu Karate team he attended the Okinawan World Karate Championships participating in Seminars under leading karate masters including Sakumoto Sensei of Ryuei Ryu before a week long training camp with Hanshi Sugihara Kenpu. Senpai Martin gained his Shodan (1st degree black belt) in December 1998, and helped Kyoshi Len Monk run the Birkenhead Dojo until 2000. He received his Nidan (2nd degree Black Belt) in December 2002. Into his 50's Senpai Martin has also started competing in Tournaments, finding success and showing age is no barrier he started with a 3rd placing in the veterans individual Kata division at the 2004 NZ Open held in Auckland. Senpai Martin has kept busy attending FRK NZ Summer and Winter camps as well as seminars in NZ held by top International Instructors including Nishimura sensei, Sakumoto sensei, Wayne Otto sensei, Ogami sensei and Tomishiro sensei. He has also trained to be a National referee. One of Senpai Martins mayor acheivements has been completing and passing his 6 hour 3rd dan grading in November 2006 still one of Fushin Ryu karate's toughest gradings to date and is working hard towards his 4th dan. 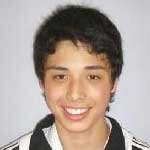 Since 2007 he has been coaching at the 3 Karate NZ national training camps as well as refereeing at local,regional and national tournaments. Recently senpai Martin competed at the 3rd Sugihara Cup, an International karate tournament where in the Veteran Male division he placed 2nd in kumite and 3rd in kata. He was also the assistant coach to Sensei Duane and Sensei Braedyn at the WKF Junior World Championships held in Morocco 2009. Senpai Martin currently assists Sensei Duane and Chikako in teaching at the Hombu dojo in Brownsbay. Senpai Dave Harris started karate in 1975 at the age of 13 training under Sensei Jack Sims at the Chidokan Dojo on Albert Street. Aged 22 he joined the NZ Police where he learned the basic Tae Kwon Do and Aikido holds taught at the time. While in the Police force he trained and qualified as a PR24 Baton Instructor. As an Instructor he trained newly graduated officers in the use of the baton as well as dealing in riot situations. Senpai Dave started his training in Fushin Ryu at the Birkenhead Dojo under Hanshi Len Monk where he progressed to brown belt before shifting to the Albany Dojo where he gained his Shodan (1st degree black belt) in December 2000. He graded to Nidan in December 2002 and to Sandan (3rd degree) in November 2006 in one of Fushin Ryu karates toughest gradings to date. Sensei Dave graded to Yondan (4th degree) on the 4 of March 2018. He now teaches at the Glenfield Dojo under the guidance of Kyoshi Len Monk. Senpai Dave competed in Regional and National tournaments finding success in this area of his training. iSome of his results being 2nd places in both kata and kumite at the Central Regional tournament in 2000, 1st in kata and 3rd in kumite in the veterans division at the NZ Open 2003 a 1st in kata and 2nd in kumite in the veterans division at the NZ National tournament held in Wellington 2003. He also placed 2nd in the veterans Kata division at the NZ Open April 04 and Joined Sensei Duane and Senpai Martin to compete in Team kata winning the National senior team kata title. Sensei Dave is currently a WKF Kata judge (B) and WKF Kumite Judge B one of only five WKF qualified people in NZ. He is also an Oceania A grade Kata Judge and B grade Kumite referee and holds Karate NZ A grades in both kata and kumite. 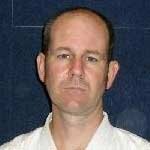 Sensei Dave is on the Karate Auckland referee council and is the Chairman of the FRK NZ Referee Council. 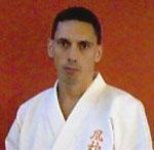 Senpai Jeremy Alexander began his karate training at the Bayview dojo in 1993 at the age of 13 under Hanshi Len Monk and Sensei Bob Martin. 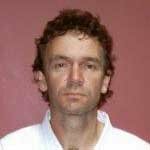 With the return of Sensei Duane Monk from Japan in 1997, he continued his training at the Browns Bay dojo, and then at the newly opened Albany Fitness Centre, where he gained his Shodan Ho in 2002, and his Shodan in 2003. In 2004, Jeremy, represented New Zealand, at the Oceania Karate Championships, in Fiji. Along with his teammates, Senpai Shamendra Hurbuns and Senpai Brendon Running, they took second place in senior male Team Kata. In 2005 he competed for NZ at the Karate Commonwealth Games, held in Wellington. Competing again in Team Kata, along with Shamendra and Scott Morgan, they came away with 3rd place. 2006 was a busy one. There were lots of competitions while training hard for grading. The 1st Sugihara Cup was held; Senpai Jeremy competed in three events, and managed a first place in all three. Divisions included, Individual Kata, Team Kata, with Senpai Shamendra and Brendon, and in Team Kumite, with Mike Lynch and Brendon. Also in 2006 the 12th Oceania karate championships was held in New Caledonia. The NZ team of Senpai Jeremy, Brendon and Shamendra lost to the Fijian team taking 2nd place. At the end of 2006, a grading was drawing near. Senpai Jeremy gained his Nidan grade, along side Senpai Chikako Monk, Shamendra Hurbuns and Lars Wedinger. Senpai Jeremy with a keen interest in Iaido trained at the Hokushin Shinoh Ryu Iaido dojo in Auckland. 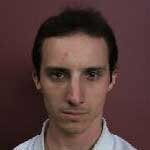 Senpai Jeremy currently teaches the Fushin Ryu kata squad training on Saturday afternoons at the Honbu Dojo as well as assisting in the teaching of classes at Brownsbay. Senpai Chikako first started karate under Sensei Duane at the Bayview Dojo in 1990, training 18 months in NZ before heading to Japan for a 1 year training stint under Hanshi Sugihara Kenpu. Taking a break from Karate while having two children ( Marina and Carl) Senpai Chikako restarted her training upon returning to NZ from Japan gaining her Shodan Dec 2003. Senpai Chikako has competed in many tournaments, the 2004 NZ Open where she was 1st (veterans kumite) 2nd (veterans kata) 3rd (under 53kg senior womens kumite) following her success in the 2003 Open of 2 golds and a silver. 2005 represented NZ in Individual senior womens kata and was the captain of the National team kata group with Rebecca Keighley and Patricia Reilly that placed 2nd in the Commonwealth karate championships. In 2006 she gained her Nidan (2nd degree) at one of Fushin Ryu karates toughest gradings. Senpai regulary attends seminars, seminars with Wayne Otto o.b.e, travelling to Japan, training under many top Japanese Sensei in July 03, Germany August 2002 at the German karate Summer Camp training under world famous Sensei including Nishimura Sensei and Gunta Mohr Sensei to name only a few. Senpai Chikako currently teaches classes at the Brownbay dojo. 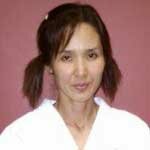 Sensei Chikako graded to Sandan (3rd degree black belt) in December 2010 and spent many years as an assistant national kata coach for Karate New Zealand. Senpai Brendon Running begun his training in 1998 at the age of 10; one of Shihan Duanes first new students on his return from Japan. Brendon made his way quickly through the grades gaining his Shodan in December 2003 and currently holds his Nidan gained in November 2010. 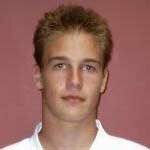 Brendon was quickly involved in tournaments and made the New Zealand Team for the 2004 Oceania Karate Championships in Kumite and Team Kata (with Senpai Jeremy & Senpai Shamendra) gaining a silver and bronze medal. Moving into the Senior age category in 2006, Brendon quickly became an integral part of the New Zealand team competing at various World, World University, Commonwealth and Oceania Championships. Senpai Brendon is the current Commonwealth U75kg Kumite Champion with back to back gold medals in 2011 & 2013 and Oceania U75kg Kumite Champion with back to back golds in 2010 & 2012. He is the current Captain of the New Zealand team and heavily involved with training camps and tournament preparation including assisting coaching staff at the World Junior Championships in 2011 and 2013. 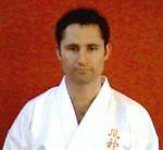 Brendon taught traditional classes at the Archers road dojo from 2004 – 2005 and 2007 – 2009 and also assists Sensei Braedyn with Sunday Kumite classes. Brendon is currently on his OE where he is living and training in London while competing in various European tournaments. Sensei Marina started her Karate training in Japan at the Yokosuka dojo at only two and a half years of age. Sensei Duane had started a parent / child class to cater for the numerous inquires for classes for 3 year olds from the American Parents. 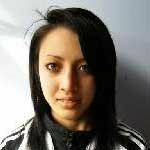 Marina has competed in many tournaments from the age of 6 winning many National kata and kumite titles. Sensei Marina has won many New Zealand national and NZ Open gold medals. She placed 5th in Kumite at the 2009 WKF Junior world championships and was through to the 4th round in 2011. In 2014 she won Gold at Oceania in the u21yr female kata and won her bout in final of the senior womens team kumite taking gold with her team mates. In 2015 she won gold in the senior womens kata at the Commonwealth Championships. She has trained extensively in Japan attending many seminars conducted by some of the worlds top Karate sensei. She now passes this knowledge on through her classes at the Glenfield dojo on Tuesday and Thursdays at Archers rd, at the holiday programmes at the Browns Bay dojo and by teaching private classes. Marina is currently graded to 2nd degree (Nidan) in Fushin Ryu. Sensei Marina can be contacted by email if you are interested in Private Lessons. Senpai Carl started training when he was 4 years old. He has won many New Zealand national and NZ Open gold medals. He has trained extensively in Japan attending many seminars conducted by some of the worlds top Karate sensei.